She did NOT just say that! After morning nap time we went to the mall and played in the indoor play area! I like this play area because it has a lot of things for smaller kids verses a real playground where pretty much the only thing he can go on is the baby swings. We also walked around the mall and got some chick fil a! Back home and we played a lot in the living room and watched Ellen! Carter doesn’t always look at the TV when it’s on but once and awhile he will get close and point at it or try to touch it. Sometimes if cartoons are on he will sit and watch for about 2 minutes before going off to do something else. After daddy got home from work we had dinner up on the roof deck! Carter loves crawling up on the lounge chairs and looking over the side through the railing. So what does your kids day look like? Link up with us and share your story! 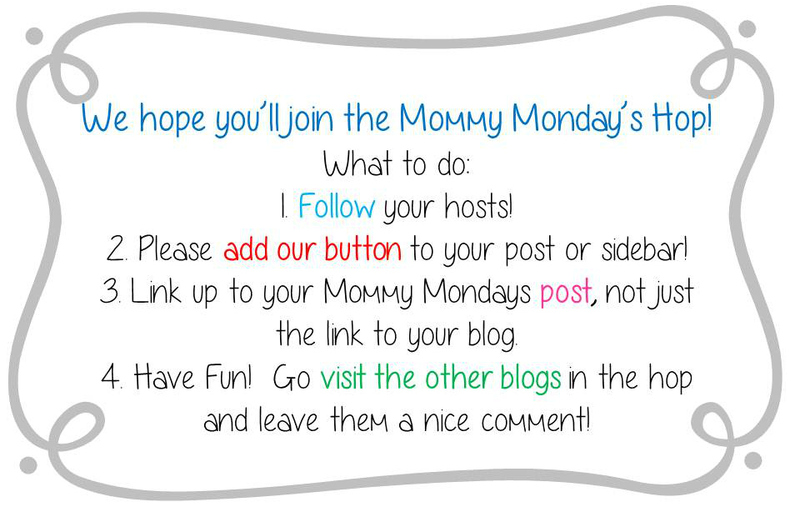 Please take a button for your post or sidebar to help spread the word about The Mommy Mondays Hop! Take 50% off this ad spot with promo code super! He's got quite the life 🙂 Such a cutie, he is! Beautiful Baby Pics. He is so cute. I love his little faces! Sounds like a fun life! Your mall indoor play area looks awesome. We live in a small town, so that is one of the normal-sized city amenities that I miss. Thanks for hosting this blog hop. I love the idea of "a day in the life." he is getting so big and you can tell he is getting so much personality!! he is adorable! !